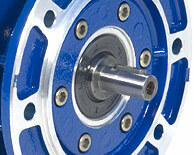 N Series - Mechanical Speed Variator "Disc type" fluid traction drive. 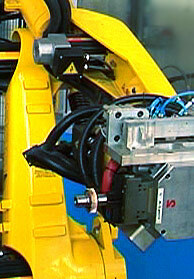 Are you seeking quiet & reliable variable speed for your machinery? No complicated electrical wiring, wash-down problems, or science book to study before using? The N Series is what you're after and the straight forward fact that these are simple and affordable doesn't hurt. Turn the knob while operating, and the speed increases, turn the other way and it decreases. Very low maintenance, and when you change the oil all you need is Dexron II ATF. 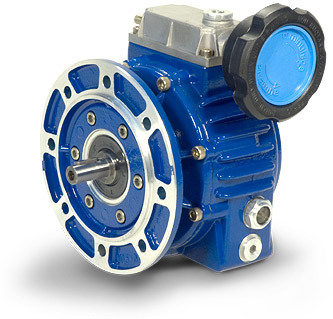 These range in hp from fractional to 5hp and in gear motor package are around 3 to 4 times the price of a motor alone. When combined with a TVT Gearbox and OEM volumes the pricing becomes very aggressive. 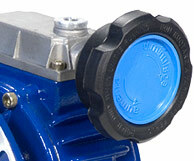 Sizes 003 to 20 Housings & Motor Flanges of aluminum, finished inside & out in polyester epoxy blue RAL5010. 30 and 50 (3 and 5hp) are in engineered cast iron with epoxy paint. 6~1 variable speed range with 1:1, 2.5:1, and 5:1 fixed gear outputs + C-face output available. Discounted pricing for motorvariator package - all from TVT Group. up to 85% transmission efficiency, with motor running at 100% speed (no cooling issues). Epicyclical transmission design, quiet, smooth, and efficient transmission of torque. Bearings ISO Precision Metric ball bearings of 52100 vacuum degassed steel. Lubrication - Reducers are supplied with the proper amount of High Performance SCH634 Synthetic gear lube formulated for improved worm-gear efficiency & life. However, we can supply reducers dry at clients request. Easy to view "Fish-eye" type oil sight glass standard. Gearmotor, gear-brakemotor, gearmotor-variator, complete drive packages available from TVT's total manufactured solution... local service & support, global reach via TVT Group.